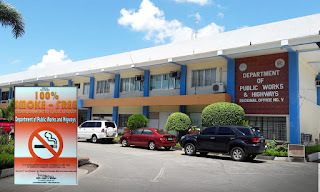 The Local Government Unit of Legazpi City, Albay has certified the Department of Public Works and Highways (DPWH) Bicol Regional Office (DPWH Region 5) as 100 percent Smoke-Free Establishment. The certification signed by Mayor Noel E. Rosal, Chairperson of Smoke-Free Legazpi City, was received by DPWH Region 5 Chief Administrative Officer Dr. Flocerpida B. Azotea in a ceremony held recently at Kenzon Function Hall, Legazpi City. In his message at the DPWH flag raising ceremony, Regional Director Danilo E. Versola expressed his sincerest gratitude to the DPWH workforce, particularly the male officials and employees for their cooperation in making DPWH Region 5 Office a smoke-free zone. “For an office like DPWH which is dominated in numbers by male employees, the no-smoking policy is a huge challenge,” added Director Versola. 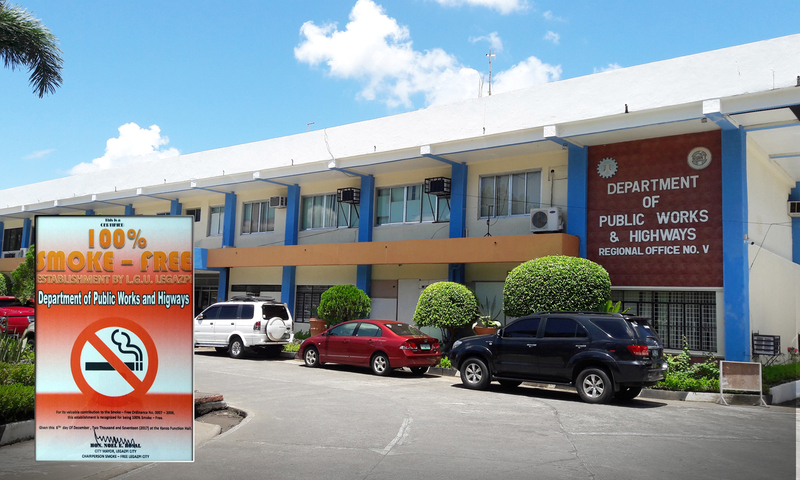 The Local Government Unit (LGU) of Legazpi City issued City Ordinance No. 0007-2009 as part of the initiative to enact anti-smoking laws in accordance with Article 2, Section 15 of the 1987 Philippine Constitution that mandates the state to protect and promote the right to health of the people and instill health consciousness among them. Legazpi City Ordinance No. 0007-2009 aims to regulate and promote a healthful environment and protect the citizens, especially the youth, from the hazards of tobacco and, at the same time, ensure that the interests of others are not adversely compromised. To ensure strict compliance to this policy, Mayor Rosal formed an enforcement team called the Legazpi City Smoke-Free Unit. The unit has 459 deputized agents who shall apprehend persons who will violate the ordinance within the City’s jurisdiction. The giving of awards and certification to deserving private and government establishments is part of Legazpi City’s intensified awareness campaign to promote a clean and healthy environment in workplaces.